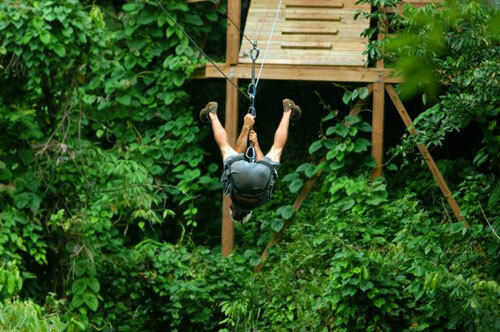 Why experience Vámonos’ Zipline & Nature Adventure? 2. The guides – Our Batey guides are mostly all organic farmers, not simply locals who just “throw you through the air.” They are land lovers, people who won’t just name any plant or specimen or creature on the walk but who’ll also tell you the many uses of them in the wild. This is precious! 3. 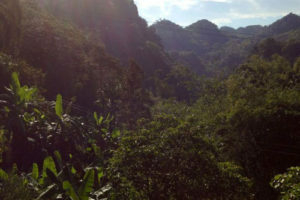 The location – Our experience takes place in and around the Rio Tanama River and its surrounding forest near the town of Utuado. The land is remote and separate from civilization. Travelers say that the experience is like a retreat with mother nature. Caguana Indigenous Ceremonial Park in central Puerto Rico. 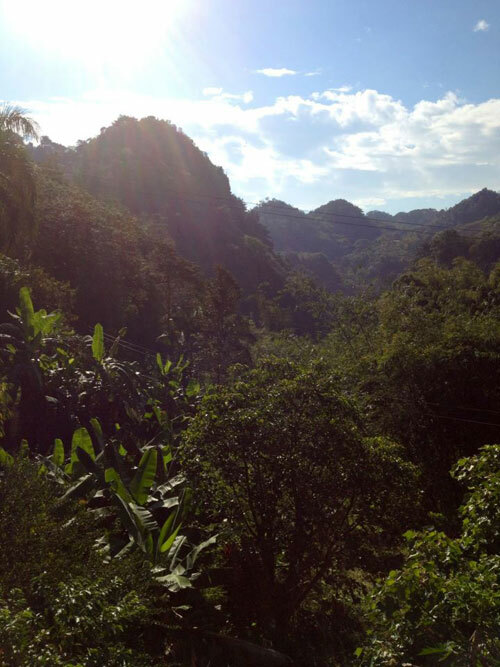 We start the day with an interpretive hike through the forest where we learn about the area’s flora and fauna. Along the way, our guides often demonstrate the sting of the itchy “pica-pica” leaf and teach us about bats among other things. We love our partner eco-adventure company (click to see many pictures) for many reasons, but mostly because they put our travelers’ safety and the environment at the top of everything they do. During the hike, we’ll go through rocky paths and rugged terrain, but not without plenty of breaks and cultural teaching moments. 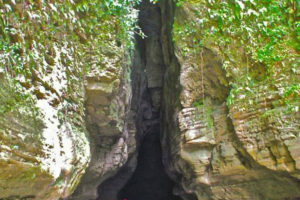 Depending on the weather and rainy season, the hike will take us either through an underground river cave or through a narrow, secluded, virgin cave, both with their share of non-touristy friendly bats. We’ll use special helmets to protect us both during the hike and the cave tour. 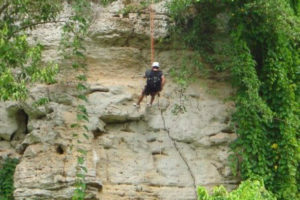 Once through the cave experience, we’ll prepare for our zip-line adventure. Unlike other zip-line companies, this one usese two cables instead of one, doubling the security of our travelers through at least four different lines. Those afraid of hieghts or reluctant to fly through the forest’s canopy can take pictures of their peers “flying” while they wait for them on the other side. As the day evolves, we’ll cross a small “Indiana Jones-type” hanging bridge and hike a bit more. If time permits it, we’ll also see a 100% sustainable forest home (“you’ll really feel like visiting Tarzan’s home”) and learn a bit about organic farming. This home uses solar power for electricity and a sophisticated way to bring fresh water into the property. 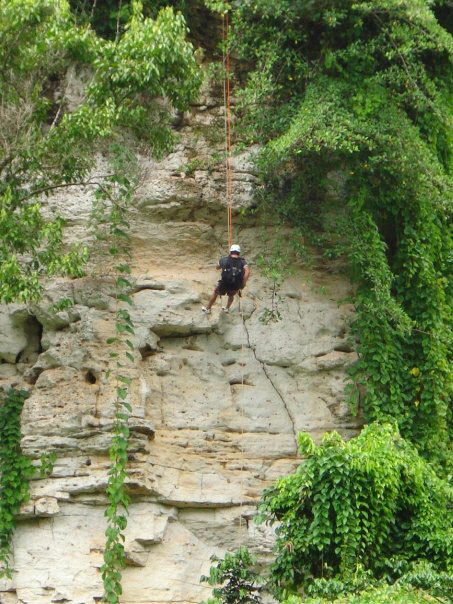 Find out more about our partner company: Batey Zipline Adventure here: Batey Zipline Eco Adventure by Puerto Rico Day Trips. This adventure day is usually the highlight of many of our travelers. Rain or shine, dry or muddy terrain, our travelers will hike. It’s all part of the experience of spending one day immersed with mother nature.